The major new features present in each version are listed below. The information appears in reverse chronological order. If you need support or futher information about ResourceSpace Digital Asset Management software, please feel free to get in touch. Version 9.0 is a significant upgrade with major improvements to how resources are found (via the new browse bar), managed (via direct editing of search results), and secured (via a new search filter builder). A new Browse Bar allows browsing of content by tag / featured collection / workflow state via a slide-out panel on the left displaying a folder structure. A new, more intuitive interface for search filter configuration making it easy to restrict searches on a user group basis. Upload here functionality allows upload directly to a search result set, with metadata mirroring the search result criteria. A new 'Upgrade available' dash tile shown only to Admins and Super Admins when new ResourceSpace version is available. A new ResourceBot plugin integrates the Chat Bot functionality from the main ResourceSpace website for in-line assistance and will be extended with training programmes soon. It's now possible to edit all the resources matching in a search result set making metadata management more straightforward - there's no need to add the results to a new collection first. When using the edit function on an entire collection (batch edit) a new option allows data migration from a different field, aiding with metadata schema revision. New functionality to assist with reordering large lists of metadata keywords for fixed list and category field types, including a position indicator and the option to move a keyword to a new position numerically. It's now easy to set background (wallpaper) images for the login page, home page and featured collections page from the same screen. Additionally, both the login screen and featured collections page support animated slideshows. It's also possible to re-crop existing slides without having to select the original resource again. Users can now view all the workflow states in their 'My contributions' area. It's now possible to set which workflow states appear in the main search, in addition to the live state. The Google Vision AI image recognition support now includes the capability to extract facial data. This can be used to trigger additional metadata entry when faces are detected in uploaded images, assisting compliance with legislation such as GDPR. The Google Vision integration now supports the ability to reprocess a specific collection. Several of the slower processes can now be executed offline, such as preview generation and large zip downloads. The workflow state of a resource can now be used as a criteria for restricting access to higher resolution downloads. A new configuration option automatically disables inactive users after a defined period. Several enhancements to the responsive mode used for mobiles/tablets to improve layout. The image_banks plugin allows stock image galleries to be searched from within ResourceSpace. Assets found can be downloaded to the ResourceSpace system for reuse. For this initial release, Pixabay is supported, with more to follow in version 9.0. The API test tool allows developers to try API commands prior to inclusion in their projects, meaning integrating with ResourceSpace is now easier than ever. During upload, file processing can optionally be passed to an offline job queue so the upload proceeds more quickly and the user can get to work without having to wait for preview processing. A new cookies_notification plugin shows a cookie consent message in the header. Optionally, consent is required before the user can proceed to use the system. We have also added a consent request to the user registration form. These features together build on similar features in the last release and aid organisations with GDPR compliance. An optional new PDF viewer with the ability to browse the full PDF document in-browser and search for text within it. Several simplifications to the installation page to streamline system setup. The session_autologout option is now enabled by default for improved security out of the box. Added the new API function api_resource_log_last_rows() allowing recent updates to ResourceSpace to be polled remotely. Added the metadata field option 'Include in CSV export' which can be used to remove unwanted data from CSV metadata exports. CSRF protection is now enabled by default. Added the capability to process existing images with Google Cloud Vision to leverage AI for your existing assets. A new option to use single slideshow image for all of the Featured Collection pages, instead of an image from within each collection. The SimpleSAML plugin now has the ability to 'adopt' existing ResourceSpace user accounts with matching emails, and also has the ability to authorise users based on an extra assertion received from the IdP. This is useful for situations when not everyone with a SSO account should have access to ResourceSpace. Added the ability to specify custom contact sheet sizes. Multiple style changes to modernise the UI. Colour pickers for text, dash tiles, simple search and the collection bar. Simplified the top user/admin menu links - icons with no text. Log out function moved to the bottom of the user menu. The current user's name is moved to top of user menu. Added the ability to select the font in System Configuration. Removed the ASC/DESC dropdown for result ordering and made the icon clickable (more intuitive). Show the resource count when editing keywords for a fixed list metadata field - you can see how many resources your changes will affect. The resource type icons optionally displayed on the search thumbnails now use FontAwesome icons. A wider preview image and improved layout for the resource view panel. The ability to specify via a new option which metadata fields may contain personal data, and a new personal data export tool, to assist organisations with GDPR compliance. Video bookend capability - add an image to the beginning and end of a video when downloading. New winauth plugin allows sign in using Windows Integrated Authentication. Added initial baseline capability for the IIIF API. Publishing of resources from ResourceSpace directly to Falcon.io. New installations will now use MP4 for video previews by default, removing the dependency on the Flash plugin. Security enhancements - improved CSRF and CORS protection. A new option when transforming images that allows user to select from preset quality settings, and another option to force that the transformed file uses the sRGB profile. Related resources can be shown either in a table or as thumbnails. It is now possible to configure which social media sharing links to show when sharing resources. Improved the UI of the antivirus plugin, providing styled alerts if file is unsafe. The category tree field type now displays in a model when accessed from the simple search bar. The Plugin Manager has been updated with improved categorisation and search capability. New Google VR View plugin enables viewing of panoramic images directly from the resource view page. An upgrade to the Video Tracks plugin adding the ability to generate custom video formats for the original file without needing any alternatives or subtitles. The user can choose to transcode in real time or add to the job queue when downloading. Added the ability to upload an original file and its alternatives in one batch. Faster metadata entry via a new option to lock metadata fields to use for subsequent resources during upload, in the 'Upload then edit' mode. The ability to save data for all subsequent resources using the Save and auto-next button. Staticsync file ingest improvement - the ability to allow admins to specify the exact folders that need to be ingested. Minor UI tweaks to modernise the interface. Removed superfluous dividing rule lines. Removed labels from the search header and made the options more obvious. Improved layout for the dash tile builder by including the preview at the top. Small icon that indicates sort order above results. Major update to result display. Removed use of tables, simplified HTML. Panels scale depending on number of display fields set. Dropped the small thumbs view, made the xlthumbs view use the strip display to focus on the image itself. Added Google Vision API integration plugin - automatic image recognition and tagging. New 'My Actions' area. All the tasks requiring your attention, in one place. Added a new date range type field with EDTF support. Streaming .TAR file collection downloads for super-fast batch downloading. "Widget mode" for PLUpload on by default - improved uploader display with thumbnails. Resolution selection capability for videoJS. The ability to have language placeholders in metadata display templates. Keyword stemming enabled by default for new installations. "Upload then edit" mode presents the user with the upload box first rather than the metadata entry page. A temporary collection is used for uploads as a holding place prior to submission. Pill-like display for selected keywords. Cryptographically secure and longer keys generated by default for api, scramble, spider keys. Improved EMu integration - the ability to synchronise EMu with ResourceSpace in a master-slave relationship with the ability to also pull in media files as either original file (upon creation of the resource) or as alternative files (when updating existing resources). Added the capability to remove user custom access from the resource share page. API: Added the ability to create a resource, upload a file and add metadata in a single API call. API: Allow an array of resource IDs to be passed as an argument in order to reduce number of calls to the API for getting the resource path of a batch of resources. A restructuring of the database to hugely reduce storage volume and speed up search by normalising storage/indexing using data "nodes". Added x-frame-options header for improved defense against XSS attacks. Set to DENY by default but can be amended in config.php if required. UI enhancement - standardise header between edit and view pages when in a modal. New installs by default have the new "tiled" Featured Collections layout. New and improved API, API v2 - a new simpler REST based API using user-based private keys and signed queries for increased security. Existing built in functions are wrapped and exposed via the API. See the Knowledge Base for full documentation. Improved the default metadata fields to include some generic checkbox lists. Contact sheets much more configurable with template support. Retina Mode uses higher resolution images for thumbnails and previews, intended for high resolution displays such as Macs and tablets. Enabled in User Preferences. KE Emu databases integration. Based on IRNs and a mapping ResourceSpace is able to pull in data from EMu databases. Improved setup process handles required fields better using the 'required' attribute. If the provided username already exists, the password is updated, rather than an error being generated. Live video preview by hovering over search thumbnails. Flickr integration updated to allow for upload sizes to be selected. $alt_files_visible_when_restricted config option, on by default, makes alternative files visible (but not downloadable) when resource access is restricted. The user may then request access as for other resource sizes. Option to not enable the Google Maps layer. Google Maps layer disabled by default. Several fixes for PHP 7 compatibility. Performance improvements for special searches. Various minor bug fixes relating to mapping, terms on download, legacy styling. User interface update including Font Awesome icons and several other visual improvements. New functionality to assist with geolocating collections. Added the simpleldap plugin to base for improved LDAP support. Added the simplesaml plugin to allow SSO from SAML2 based IDPs e.g. ADFS, Shibboleth, OpenAM, OneLogin. Dynamic sizing when embedding a slide show. New $default_to_first_node_for_fields option allows the first node to be the default for dropdowns. Ability to change the header background colour on the System Configuration page. Customisable dash tile backgrounds using new colour picker. Introduction of expandable "More" / collapsible "Less" link for large resource log entries. The resource log now stores output from the various transcoding processes. The ability to choose whether user wants to write metadata on download. Import / export metadata field options capability. ARW support based on the embedded thumbnail in the raw file. Media search function allows searching by height/width/size/extension of attached media on Advanced Search page. Dash tiles can now be pushed to specific user groups. New "push metadata" option when relating resources. When relating a resource of a type that has this flag set, the metadata for the resource will show on the parent resource's view page. Useful for linking to 'core metadata' from another resource, e.g. linking a photo of a person to a 'person' resource record containing their details. New "video_tracks" plugin allows custom video to be created using alternative audio/subtitles. Alternative SRT files are automatically converted to VTT for use with VideoJS. Includes a new job queue system we will build on in future releases for transcoding and other intensive operations. Added the ability to select a colour for dash tiles. Option to view external shares in the 'logged in' mode when viewed by a user that is logged in. Ability to hide the bottom Home/About/Contact navigation links. Hidden by default now as these are in the header. Streamlined the installation process - fewer fields required. Watermarks are now more configurable with the ability to center/align. Support for alternative files when using staticsync. New "$search_includes_resources" config option allows resources to be excluded from search results, so search results contain only collections. Useful in some cases where collections are the primary focus. Moved Team Centre link to the right and recapitalised. Now opens in a new modal. System also opens in a modal. The 'current user' list on Team Centre has been moved to the manage users page. Added the Manage Slideshow function - super admins can now change slideshow images through interface and add or replace using transform plugin using add new and replace buttons. Introduction of search fitler override for users which overrides any inherited search filters from default config/config/group. OCRstream plugin, a wrapper for tesseract OCR. Help now shows in a modal. "Help & Advice" is now "Knowledge Base" and embeds the main ResourceSpace site's content. Added new $user_pref_daily_digest option which will send users a summary of all unread system notifications from the last 24 hours. Admin username & password on setup page. These credentials will be for the first user of the system. Transform plugin is now enabled by default as it is always used to manupulate slideshow images. '$file_upload_block_duplicates' option prevents upload of duplicate files. Requires $file_checksums=true. '$static_slideshow_image' option. Home page will show a single randomly selected image from the available images on each reload. Allow internal preview sizes to be editable with new config internal_preview_sizes_editable. Code includes removing the option to delete the size if it's used internally. Advanced search may now be restricted by "Contributed by". Also changes made to user selector to allow for single user selection. Option to lock the system down to prevent PHP and SQL entry even for super admin - useful for multi-tennant systems. Added options to prevent notification message pop ups and to mark notifications as unread. The ability to set the administrator's full name and e-mail on the initial setup page. Clicking on messages from 'My Messages' will now open them in a modal so they can be seen more clearly. Added new '$login_background' option. Uses the first image from slideshow as the background to the login/account request/password reminder pages. User uploaded plugins now go in tothe /filestore/plugins/ folder. Data only resource types and metadata PDF generation based on templates. Nodes work phase 1. Metadata field options are now stored in a new 'node' table and managed using a new page rather than a text box. Data storage and indexing are at this point unchanged - that work takes place in nodes phase 2 for the next release. Added the version control plugin from the ResourceSpace Enterprise programme. New activity log, logging of most user actions, not just resource actions. The ability to change the logo from the System Configuration page. My Account now opens in a drop-down menu. Use VideoJS HTML5 player for mp3 previews. Added WordPress SSO plugin - use WordPress for user authentication. You can now store originals in a separate location within the filestore using $originals_separate_storage (off by default). Ability to edit plugin text strings from Manage Content. A new option to prepend wildcard to keyword when we always apply wildcards to a search. Added support for search superaggregation - an experimental performance improvement, off by default. When searching in Manage Content, show language and user group columns, as these entries are expanded out when searching. Improved the terms and conditions acceptance by having a tick box which is more typical and means there is no need for a 'I decline' path. Added theme breadcrumbs, also added to search page if not already using $search_titles. Added a new CSS class 'current' to header links with updated default styling so the current section is highlighted. New field type 'warning message'. When text is entered, a warning message appears on the resource view page and the download is initially disabled, in a similar fashion to expiry date fields. A new System Performance page to help assess performance of various installations and identify issues. Added the resource_tools_compact plugin. Alternative resource view page styling with concertina functionality for resource tools and metadata. Added the tms_link plugin. Allows data to be extracted from TMS (The Museum System) via direct database connection. In-software messaging functionality using a pill count notification system and a messaging inbox on My Account. The Bulk Mail function has been extended to support sending of internal messages as an alternative to e-mail. New User Preferences functionality in My Account gives users control over basic configuration. New System Configuration functionality in System allows some common configuration options to be altered from within the software itself. The news plugin updated to be in line with the recent style changes. 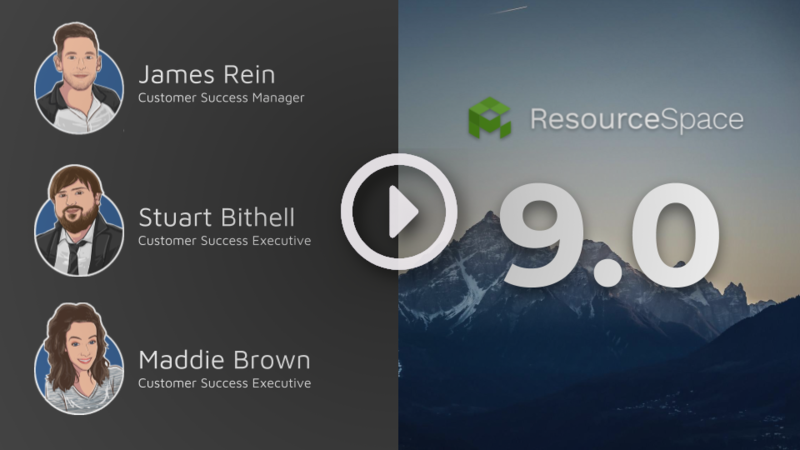 New 'yt2rs' plugin allows the addition of YouTube videos to ResourceSpace. A new "simple view" for featured collection categories using basic tiles wih no images. A new permission 'noex' that will prevent external shares from being generated by users whilst still allowing internal sharing. Upgraded the 'embedvideo' plugin to use videojs for full HTML5 video support. Improved the ability for users to subscribe to reports. User groups can be selected, rather just the user or all users. It's also possible for individual users to unsubscribe from group/everyone subscriptions. Added a new option to control how popular suggested keywords must be, in the event that a matching keywords was not found during search. Several improvements to the offline ingest staticsync tool: the mapping can be used to set archive state; the folder path can be set to a text field; option to append multiple mapped values rather than subsequent matches overwriting previous. The ability to attach a smart group to collection. This differs from previous group selection in that the group itself is attached rather than attaching all the users in the group at that point in time. Users added to the group will gain access even after the collection sharing was set up. A new option to control permission priority - "$custom_access_overrides_search_filter". Off by default, it specifies that granted user/group custom access should always override search filters set on the user group. CSV and PDF export of metadata for resources returned by a search and the option to include a CSV with this data when downloading a collection. Further extensions to the home page dash with an administrative management tool. Clicking your name at the top now leads to a new My Account page and the password change and language pages are a link from there. New unified actions dropdown replaces collection actions across the system. Resource views and edits from search appear in a draggable modal for easier navigation and rapid editing. Added a health check page that checks basic health of the system, useful for remote monitoring. API extension - the ability for api_upload to accept a fileurl parameter in place of a POSTed file, and curl will instead grab the file server-side. Also added the ability to rename the file using the filename parameter. Uploading new alternative files is now possibly only via PLupload so large files are always supported and uploads are more stable. New $staticsync_defaultstate option allows the workflow state of sync'd assets to be set, e.g. so injested assets go in to Pending Submission or Pending Review, similarly, an option to set that resources as created by a defined user account. New $edit_access_for_contributor config option, when set to true means contributors can always edit their own resources regardless of permissions/state. Moved the colour styling to a new system. No more 'chips', these are reinstated as a user preference option in My Account instead. Added functionality to support collections with anonymous access. These will be converted to full collections if the user subsequently requests an account. Play video previews on thumbs and small thumbs search result pages. Added the ability for dash tiles to store external URLs. A new swf_preview plugin to allow SWF files to be displayed natively in Flash Player on view page as previews. Added edit functionality for dash tiles. Search result order and 'per page' selectors are now dropdowns rather than lists of links to create space for the new actions dropdown. A new blank tile option for search tile types. Display all other information and options except the background image. In search results, the envelope icon now links to more general 'share' function. Homepage dash functionality, reorderable tiles to link to searches, collections and themes with multiple designs. Built around a simple API for easy additions to tile styles and types. The responsive plugin that has been funded by the Enterprise programme has been added to the base. This adds mobile and tablet support. Improved drag and drop support for resources. Resources can now be dragged between search results and the collections bar. They can also be dragged to a new side bin which mirrors similar functionality on the home page dash. A new system console page (for administrators) for polling and monitoring the debug log, memory & CPU, and database queries. Added the Subversion plugin that allows ResourceSpace updates from within the application. A new 'maintenance mode' configuration option to let users know the system is down for maintenance or other reasons. Plugins are now arranged in to categories. Improved the styling on the setup page - a cleaner, wider layout. Swapped the rarely used FTP settings with the more typically required SMTP settings. Added the $global_permissions_mask config option which removes selected permissions for all users. Handy for quickly making a system read only. Added the $mysql_log_transactions option to log changing MySQL statements to a file so it can be replayed against a restored db. This is intended to complement existing periodic database backups enabling transactions since the last backup to be 'replayed' to bring the database up to date. Added the ability to remove custom access to a resource via the resource edit page. A new $resource_field_verbatim_keyword_regex config option that when specified, allows a user to keyword verbatim regex matches for that field (regardless of field separators). Quoted searches will return such matches. Added the ability to limit the total size of the files that will be zipped - and set a sensible default of 1GB. This is intended to prevent a situation whereby a user causes performance issues by downloading an excessively large collection. Updated YouTube plugin (youtube_publish) to support YouTube API v3. For the English language, "Themes" have been renamed to the more descriptive "Featured collections". A new plugin for auto-assigning managed requests to users based on a metadata field and its value. Improved performance of auto saving by only saving the field that's changed. Improved the checkbox field display by adding a single column mode for fields with long average values. For CKEditor in Manage Content, disabled some formatting functionality by default to ensure that HTML produces uses standard styling. Index the name of the resource type as if part of the metadata of the resource. This means that a search for "cat photos" will always return matches for items of the "photos" resource type even if "photos" is not part of the resource metadata. Bug fixes and language updates. Stemming support using the Porter Stemming algorithm for English, German, Spanish and Norwegian. It's now possible to edit all system text in 'Manage Content', not just selected paragraphs. Security enhancement: updated password storage to use SHA-256 hashing. The password reset function now sends a reset URL rather than a new password for improved security. Updated the flickr publish plugin. The ability to select a user group when sharing collections and resources externally, which will dictate the permissions used for the share. A modern new 'slim header' design, enabled for new installations. Redeveloped System Setup bringing it visually in line with the rest of the system. Native HTML5 video playback support using VideoJS. Added stylised icons to the home page panels (previously part of the new 'multicol' theme only). The ability to upload user group specific header logos. High visibility accessibility plugin adds a high contrast skin for partially blind users. The ability to annotate individual pages of a document (e.g. PDF). A new 'large slideshow' mode for the home page, supporting much larger images and a more modern look and feel. A new 'propose changes' plugin that allows users without edit access to suggest metadata changes. Added option $share_resource_include_related which allows sharing of related resources from the single resource share via email screen. Add option $upload_no_file to allow blank uploads. Option for displaying status and access fields on upload. Ability to remove multiple resources from a collection using shift-click. Requires $use_checkboxes_for_selection. Option to show tabbed panels on the view page for the various sections. Update the splice plugin - it now handles multiple video types and correctly generates from original files an mpg as well as generating all of the relevant previews. Displays a loading box when working. Added the ability to choose whether to extract/append/prepend/ignore embedded metadata at upload time on a per field basis using new configuration options. Added a html checker to ensure that any HTML entered in to Manage Content is valid. Added an option to display related resources of selected resource types along with the resource metadata, with an optional upload link. Added caption functionality to the embedslideshow plugin. Added the option to batch replace resources based on matching file names. Added a live upload log to the upload page. A new CSV upload plugin to allow rapid import of resources. Can be used in conjunction with batch replace for faster migrations from other systems. Removed the legacy Java Uploader as PLupload exceeds its capabilities in all respects. The ability to specify custom configuraton for each resource type in System Setup, similar to the existing config override for user groups. Functionality to see related resources on the metadata tabs on the resource view page. Added support for OR matching across multiple fields when configuring user group filters, by allowing pipes in the field name to specify multiple fields. Added an option to visually hide resource types from the user interface but still have them available in the system to those users. The "Private" setting on collections is now honoured fully. Linking directly to a private collection will not work unless you have been attached to it, or you are an administrator. The general link has been removed from the share collection page, unless the collection is public. Added the ability when uploading to use the filename to generate the title. Many bug fixes, now configuration options and accessibility enhancements. The ability to notify users when their contributions have been approved. More intuitive handling of larger collections in the lightbox using lazy loading. New 'format chooser' plugin allows the download of custom formats / sizes directly from the resource view page. Improved support for CMYK thumbnail rendering. Added highlighting in search results for wildcard searches. Many minor optimisations, new configuration settings, and bug fixes. Enable mysqli by default, if the extension is available. The old extension is deprecated and may be throwing warning messages on newer installations. Support for more dynamic forms using a new 'display_condition' metadata field property. Theme category sharing improvements - internal URL, emailing and subcategory sharing. Refining results from within an external share, allowing basic searching within external shares. Search filters now support the '!=' syntax, i.e. where a field DOES NOT contain certain keywords. Support for Internet Explorer 10 after resolving a few issues. Added the ability to specify a result size limit for smart collections. This allows, for example, a smart collection containing the 10 most recent resources matching a given search term. This can be useful for embedded slideshows. Added !empty search to help find resources not tagged on a specific field, such as '!emptycaption' or '!empty18'. New license manager plugin - allows licensing data to be recorded for each resource. The system will now force a password change when 'admin' is still using the default password. Security enhancements: 'user' session cookie no longer contains the username; session cookie is optionally randomised so less 'guessable'; session cookie has 'Secure' flag set (if https); session cookie has 'HTTPOnly' flag set to prevent probing via XSS. Several other bugs and security issues fixed. Added the ability to set up a periodic report that is sent to all approved users. Added new action_dates plugin that enables auto deletion or restriction of resources based on specified date fields. Added single resource per page to contact sheet, with optional logo and footer. Also added option to hide contact sheet header. Standardised the English language capitalisation. Add option order_by_resource_type - to allow sorting by resource type in thumbnail views. Added imagestream plugin - allows uploading of image sequences to become a single zip file with an additional preview video. Added !nopreview special search to return resources with no preview images. Support for vectorized PDF logos in the contact sheets. Added new youtube_publish plugin - supports publishing of video resources to YouTube. Added a keyword hit count threshold for search auto-completion, so that rarely used keywords (e.g. mistakes) aren't included. Improved the popup info-box layout. Tidied up the upload screen - a more sensible order with the more technical options at the bottom and metadata first, and a simpler title. Hid related resources, access and status fields when uploading to further simplify the upload form. Expanded form displays a little to allow for generally wider screen resolutions. Switched to CSS gradients to reduce dependence on graphics for the default 'whitespace' theme. The option to search for themes, public and user collections on the Simple Search bar (enabled in configuration). Added the capability to have language specific style sheets in plugins. Optimization of category tree JS for older browsers like IE7. Many minor improvements, bug fixes and language fixes. Major rewrite effort: complete removal of framesets, recreated the same layout using JQuery UI Layout and dynamic AJAX loading. Drag/drop collection reordering in both top and bottom panels. Touch-enabled collection sorting and transform (cropping) plugin. New 'checkmail' plugin allows upload via e-mail. New '$use_zip_extension' configuration option shows zip file creation progress. Improved metadata report compares original file metadata with downloadable file metadata. Collection tools selectors ($collections_compact_style) are loaded via AJAX on mouseover for speed. 'Promote on home page' option for public collections and themes. Promoted collections appear as tiles next to the slide show. Preview image zooming on mouse-over. Introduced $imagemagick_colorspace config to enable a solution for dark previews. Usability improvements in the workflows for Add Resource Batch - Fetch from FTP server/local upload folder. Keyboard navigation in search/view/preview/preview all pages. Improved Russian translation; minor updates to Swedish and German translations. Added PLupload as the new replacement upload tool - HTML5 upload support with fallback to Flash / Silverlight / Java. Added config option $home_slideshow_width and $home_slideshow_height to allow changing homepage slideshow size. Added tooltip_text column to fields for display in searchbar and advanced search - these are displayed using the easyTooltip jQuery plugin. Added option to include save / clear buttons at the top of the edit form as well as the bottom. Added prune_filestore utility script to remove filestore folders that don't have corresponding database records. Improvements to contact sheet sorting; added ascending and descending sorts. Added ability for admins to rename theme categories. Redesigned contact sheet page to fit different preview sizes without overlapping the footer, end the form lines and position the preview closer to the form. Added paging to user log. Added ResourceConnect plugin allowing multiple ResourceSpace installations to be linked together. Added REGEX format check capability to metadata fields. Added new option 'theme direct jump mode' - means subcategories are hidden but can still be used by directly linking from custom home panels and nav links. Added the LDAP authentication plugin. Added the 'view in finder' plugin. Added the capability to restrict edit access by resource type, using a 'resource_type=' syntax within the edit filter. Changed default of $always_record_resource_creator to true so that new installs will default to remembering who uploaded a resource. Fixes for compact style tools and slightly widened small thumbs panels to accommodate collection tools links. Updates to the Swedish, German and Norwegian translation files. New 'filterbox' plugin adds a filter to the right hand search box. Added new option $hide_restricted_download_sizes that just hides options you cannot download instead of showing them as restricted. Filter out all keywords in get_suggested_keywords() that have a hit_count of zero, as those should actually be unused, and will not yield any results. Internationalisation: improved managing of zero, singular and plural forms in several phrases. Filename extensions are now "translatable". It's now possible for the translator to choose the proper case style of the filename extension in all phrases. Added Append option when editing category tree. Added alternate version of staticsync; support for association of alternative files by suffix. Added a new 'date' only (no time) field type. Turned on edit auto-save by default. Added support for quoted string searching. If the search query is enclosed in quotes then the keyword sequence must appear in the same order as in the search. Improved the popup java uploader. Fixed several bugs. Added missing functionality to improve consistency with the default java uploader. Updated annotate plugin to save and delete keywords. Update to enable public visibility of annotations when sharing collections - enabled by default but can be disabled in plugin setup. Added a warning when changing the resource type. Fix for checkbox fields that contain very long keywords. Added support for omitted keywords in search via the "-" sign, i.e. "dog -cat" returns resources with keyword "dog" but without keyword "cat". Added new ResourceSpace default logos, to match the logo used by the ResourceSpace site and elsewhere. Incorporated updated styling from WhiteSpace etc. into base themes, including updated CSS functions such as rounded box corners and shadows. Removed WhiteSpace/BlackSpace/BlueSpace plugins as the base themes are now very similar. Added GreySpace - a neutral grey theme. Added support for IPv6 addresses to the IP lockout feature. Started the process of moving from Prototype/Scriptaculous to Jquery / JqueryUI. The long term goal is for a more dynamic AJAX driven user interface, with frames removed. New 'embedslideshow' plugin which allows slideshows based on collections to be embedded in external websites. Security patches and bug fixes. Added config $keyword_relationships_one_way option to allow, for example, for 'cat' to match 'tiger', but a search for 'tiger' will exclude 'cat', when 'tiger' has a related keyword 'cat'. This allows certain searches to become more specific than others, off by default. Updated the Swedish and German translations. Added new 'expired resources' report. Added 'auto save' function when editing. Makes editing easier when working through a set record by record. Added resource ID search to advanced search form. Added next/back browsing to bottom of edit page, as well as top. Added "Omit field when copying" option which allows certain fields to be ignored when using the "Copy the data below from resource with ID" function. Option to display resource ID in thumbnail in search results. Added the ability to warn if a particular field is set (e.g. usage rights) when approving resources. Minor change to 'request assign' functionality - those that can assign requests (Ra perm) can see all requests, even if they are configured as an assignee (Rb perm). Fixed a problem with tiffs with embedded previews not transformming correctly. Switched to multibyte mb_strtolower when cleansing strings for indexing/searching to better support UTF-8 keywords. Made name/email required fields when requesting a resource as a "non user" (anonymous access or external share) - without these it's difficult to respond to the request. Translation functionality improvements in the shopping basket. Added mysqli support, off by default. Added news plugin for displaying news items on home page. Fix to show rich text (html) fields correctly in infobox hover. Added a plugin that performs an auto login via the IP restriction field. If there is a user whose IP restriction matches the current IP, it will be automatically logged in if the feature has been enabled for that user. Many minor bug fixes, enhancements, configuration options and plugin hooks. Added a 'remote import' plugin that allows resource files and metadata to be remotely inserted and updated via XML over HTTP. This is useful for developers working on synchronisation with other systems. Added a tool to edit (rotate, brighten/darken, recreate) on the collection level. Several improvements to search performance. Improved the spider indexable pages so they are more configurable. Added option to choose a user group so permissions are applied to resources/fields. Added option to choose which access levels are exposed. Added the ability to assign resource requests to users to approve/decline, as is already possible with research requests. Also added a 'decline reason' field which is e-mailed to the requesting user. Added the ability to hide a field from the resource view page when access to the resource is 'restricted'. This access level previously limited file downloads only but can now also be used to limit field access, for example if data stored in a metadata field is sensitive. Added disk_usage column on resource table so it's easier to calculate the total disk usage across resources, or across particular resource subsets. Set cron task to automatically update existing systems. Made the disk usage always visible on the team centre home page is it is very quick to calculate now. Added option at bottom of search results to show disk usage for result set. It's now possible to work out how much disk space is being used by resources of each type, or matching a particular metadata field, or in a particular collection - basically anything that can be searched for. Improved formatting for result count for disk usage display. Added option to edit CKeditor toolbars. You can now add further toolbars to the WYSIWYG metadata field type, such as the option to set font/background colour. Several bug fixes and minor improvements and plugin hooks. Search pages updated to offer the ability to sort on fields that aren't display fields. Fixed a bug where it was possible to edit all resources in a collection without having the ability to edit each resource. Improvements for the interace on all upload methods. Added ability to upload a single file via the Java uploader, to enable chunking support for single file uploads. Added support for sending the emails using an external SMTP server. Added the ability to deny access to the original resource file using the existing "T1_scr" syntax but extending to support "T1_" (empty ID). Added new "P" permission that allows edit only access to a specific field on the upload form only. Added support for HTML format mails to the bulk e-mailer. Some improvements for search string handling. Fixes accuracy of field-specific searches. Fixed value comparisons on saving metadata (less clutter in Resource Log and far more speed for edits on items with long extracted text. Separated out the wrapping/trimming/highlighting of display fields into a function for easier comprehension. Many fixes with word wrapping/highlighting. Added a $use_temp_tables solution for the problem of many keywords. Improves search performance. $search_titles_searchcrumbs and $search_titles_shortnames options for more detailed search titles. Updates collections search functionality to use keywords instead of hardcoded wildcards to make the Manage Collections searches AND-based. Added option to include user collections in search results. Extended research request function so that it works with anonymous access. In this event, it collects the user's e-mail address. Added $public_collections_header_only option to remove the public collections section from Manage Collections and Themes. Forces $public_collections_top_nav. Added a CKeditor metadata field type. Added special syntax to include lang variables in custom header links. Improvements to site text management. Ability to search on page, name, and text individually or simultaneously. Highlighted results. Preserve context when editing site text (added a Save and Return to List button, which preserve page offset and search). More descriptive browser titlebars for all pages via $show_resource_title_in_titlebar. Improvements to single upload (uses same metadata template method as batch uploads now). Added logging of status and archive changes. Added the ability to specify one or more 'auto approve domains' for which account requests will be automatically approved. Updated reports to use flexible title field; better created resources report. Updated Polish language - contribution from Tomasz Chwastyk. Added "direct download" link option for resources to allow users to get direct URL to resource files. Added option to display title in browser titlebar when on view resource page. Disabled by default. Added more intuitive logic to the Simple Search box when selecting resource type specific fields. It now unticks resource types for inappropriate fields. Vice versa, when selecting additional resource types, any type specific fields are reset. Added the ability to reorder resource types in System Setup. Added support for category trees to the Simple Search bar. Fixes for mime-type on download, exiftool integration for automation of mime-types. Added the ability to subscribe to reports, so that you can have them e-mailed to you on a regular basis. Update to the report page to make the date range selection more useful. Added option to enable autorotation of newly uploaded images based on embedded camera orientation data. Added value filters and exiftool filters to system setup; enables file size sorting/display option for default installation. Fully deprecated use_resource_column_data; configurable display fields are now standard. Update Chinese language, thanks to Cindy Tung at Oxfam Hong Kong. Optional global_cookies configuration implemented for colourcss, which allows the colortheme to be retained across pages/ team/ and plugin pages. Recommended, but off by default. Added hook that allows the automatic user group selection for new registrations to be dynamically replaced by a plugin (e.g. based on certain registration criteria such as e-mail address). Ability to add an 'additional' element to custom home panel arrays, for adding code such as target='_blank'. Added the ability to specify a minimum number of lines that a video must contain (pixels vertically / height) before the preview is created. In otherwords, the system will downscale only. The ability to automatically create image alternatives (like video alternatives) e.g. always create a PNG file when an EPS is uploaded. Added the ability for auto-approved account requests. Useful for demo or public access systems. Added the capability to hide fields from the upload screen. Improved implementation/configurability of Category Trees. User Ratings improvements: Editable ratings in search views, ability to limit users to one rating per resource, resource ratings summary. Improved performance for the 'related resources' display. Thumbnail display sort order fields are now configurable independently of display fields. Improved search autocomplete behaviour whereby the first item was automatically selected and pressing return would enter the autocompleted item instead of what was typed. Added option to include themes in the public collection search. Added new InfoBox mode that shows a preview image instead of metadata. Fixed bug whereby incorrect keywords were being copied from the user template to new resources. Keywords for other resource types were still stored on the user template even if the resource type was changed. These unrelated keywords were then being copied to new resources. Allowed resource type to be changed when editing resources. Resource download summary feature (off by default). Added option to display ratings stars on the search view. Added Polish language file, kindly contributed by Tomasz Chwastyk. Added Catalan language file, kindly contributed by Raul Buira. Added 'Back to Resource View' links for email, edit, delete pages. Added search_titles option to allow for more description of search context such as 'Recent 1000' 'Archived', etc. Smart collections functionality: enable saving a search as a 'smart collection', which will update itself according to its saved search. Added cross linking between the two main batch uploader mechanisms to help users with issues with either uploader. Updated German translation to current revision. Drastically optimized query performance for custom search displays and contactsheet displays. Added up/down sort indicator arrows and sort order links for search views. Fixed/improved memory of current context/sort order throughout paging and Resource Tool usage. Title and Country columns on the Resource table are deprecated. Field mapping is no longer necessary. Improved reliability of email template image embedding. Added Revert Metadata tool (simulated reupload to clear and re-extract metadata). Added ability to list associated collections on the view page. Added ability to filter exiftool extractions and to use value filters for search/contactsheet field displays. Added Retry Creating Previews on Edit Page. Added 'view report' functionality so reports can be viewed directly, i.e. without having to open them in a spreadsheet application. Added the ability to set the recent list as the home page. Added ability to name new collections upon upload. Added ability to configure fields to be displayed on the thumb-style contact sheet. Added option to include themes in search results. Critical fix to plugin manager - did not check for the creation of the 'tmp' folder first. Added an option for extending the height of the title display in search results. Better handling of very long non-breakable titles (e.g. filenames) in search results. Enabled searching by resource ID combined with the main results. A resource matching the search ID will appear first. Added basic anti-spam feature to the account request page. Added more flexible handling of resource data in search result display. Plugin manager: added the ability to enable plugins for certain groups only. Added capability to view 'deleted' resources (if system is configured such that resources go in to a deleted state instead of being deleted). Added function to 'really' delete resources in the deleted state. Added X permission to restrict resource types by group. Added detection code to check if cookies are disabled, and display a suitable message if so. Added option to restrict resource download sizes by resource type at the user group level. Added QuickLook generated previews (works with many different file formats) on OS X using qlpreview. Addition of plugin manager. Upload accepts .rsp files. Added option to set default search result display. Basic initial support for geocoded photos. Updated JUpload to latest release. Altered error reporting code so it returns errors in a JUpload specific format when using JUpload, which replaces the less useful 'string ^SUCCESS$ not found' message previously displayed. Several improvements and bug fixes to the preview/thumbnail processing. Improved Exiftool integration so that 'groupname:tagname' format can be used for more specific Exiftool field mapping. This is useful in situations where the same tag name (e.g. 'Keywords') is shared among multiple profiles (EXIF/XMP etc.). Extended default length of Exiftool field to better support multiple mappings. Added resource metadata templates. These are resources that are used purely as a source of metadata when editing resources. Added further document icons for those file types where a thumb/preview is not supported or is not appropriate. Default inclusion of new transform plugin that allows cropping of image resources. Altered account request so the system checks that the user isn't already registered first. Added subgroup tree elements to System Setup. Child user groups are now shown as subfolders in the tree structure. Added permissions search to System Setup. Fix for Safari white background boxes issue. Added ability to use a .ttf font on contact sheets. Also, ability to subset glyphs via fontforge. Added function to log e-mailing of resources. Added process locking functionality to prevent staticsync/create_previews from running if already running. Added the ability for staticsync to handle alternative files (placed in a subfolder). Fixed issue with nopreview icon and full screen display - was still using the old icons. Add option to have a "resource id" search in right nav, to allow sites that need to disable the numeric search option to still find a resource by ID. Adds !resource special search method to do this. Fixed issue with dropdown box searching. Altered date field type so it handles empty / not set dates instead of defaulting to today's date. Set that the date is reset to today's date on the upload form by default. Alteration to edit page so that dropdowns always have a blank first option instead of defaulting to the first entry in the list. Added admin ability to view user contributed resources pending submission. Added optional parameter to force system to always record contributor. Fixed a bug whereby non-image types would constantly be queries for dimensions on every resource view. For very large (GBs) files this caused a noticable delay. Option to order checkbox lists vertically, which has been set to on by default as it is potentially more intuitive. Added MP3 audio preview creation and improved the positioning / integration of the MP3 player. Improved resource/collections requesting so that custom fields can be added. New 'managed requests' functionality. At the user group level it can now be configured via 'request mode' that requests from users in that group are managed, in that requests appear in the 'Manage Requests/Orders' area of the Team Centre. Added edit filter - the ability to determine edit access based on resource metadata. Added optional 'deletion state' that resources are moved to when deleted, instead of being removed entirely. Added ability to store an XML metadata dump file in the resource folder which mirrors all stored resource data. Made resource request reason a required field. Added config option to change JUpload to use look and feel of local system rather than Java UI. Theme bar: a left-hand sidebar containing themed collections, with collapsible sections. Exiftool is Resource Type-smart, allowing different mappings for different types. Share multiple collections at once. PDF Dynamic Rip optimizes render times for extremely large and small PDFs. Add custom fields to regular large-thumb search results. Ability to batch upload alternative files. Easily name a new collection upon creation from the collections panel. For earlier versions please see the ResourceSpace Subversion Log powered by WebSVN. Let us take care of everything. Just log in and start using your system. Technically minded and happy configuring a LAMP stack?